Honestly, I don’t know where the year is going. How is it August? I’m not ready for that - I was still enjoying my recuperative July! Shotgun Lovesongs (again). It’s still great. Open City, by Teju Cole. I’m not going to write too much now, because it’s my book club book for next month, and I might write about it later - but I very much enjoyed it, and am now piling up the walking-around books (Sebald’s Rings of Saturn and Solnit’s Field Guide to Getting Lost) to play at wild and weird literary-walking jigsaws. It’s always odd to see a world you know a bit from the inside written about from the outside, So this article on ‘Born Agains’ is a weird read for me - I’d be interested to know if it’s weird for anyone else. It’s both generally friendly, but utterly bemused by these people, and I’m not sure it tries as hard as it might to get into an imaginative space to understand how they relate to God. Also, the choice of by terminology and its capitalisation is thoroughly affling: just because people might say they’ve been ‘born again’ doesn’t mean they identify themselves primarily as ‘Born Agains’. And finally, this is not so much to read, as to view. ’Greek Myth Comix Presents: Death in the Illiad’. It’s genius. Boyhood - Boyhood Boyhood Boyhood. Yes, I have embraceed the church of Boyhood. It’s astonishing, it’s still in the cinema, so go. Begain Again - not quite Once-in-New-York, or as bittersweetly wonderful as Once, but still charming and fun, even if I wanted the movie to have more Catherine Keener and Hailee Steinfeld, and less Kiera Knightly. If you weren’t in love with Mark Ruffalo when you walked in, you almost certainly were by the time you walked out. I’ve been catching up on The Good Wife. If you’ve not watched it, get on that, stat. It is smart, and funny, and complicated, and full of briliantly flawed, believable characters, including lots of women (hurrah!). At the theatre, I saw both Great Britain and Medea at the National. I didn’t like the latter half as much as the critics did, though Helen McCrory was fabulous, and if you’re in anyway completist about your Medeas (and why wouldn’t you be) you should go. The former is a lot of fun, but probably won’t stand the test of time - so go now. Hey! I wrote some things! That was nice for me. There was this piece, on Christianity, art and culture. I’m going to be reading Brueggemann’s Prophetic Imagination some time soon, so there might be more in this area. And this piece on Meg Wolitzer’s The Interestings, which I didn’t really know was hanging out in my head until I started writing. 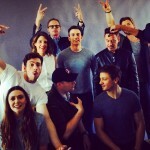 Comic-Con videos and gifs on tumblr: specifically the Avengers Cast. Seriously? These guys are dorks. Augustus, by - which I am half way through, armed with pen for Cicero-related note scribbling, and loving. The Brothers K, by David James Duncan, which was recommended to me for including both baseball and faith. Colorless Tsukuru Tazaki and His Years of Pilgrimage, by Haruki Murakami. A new Murakami is a thing of joy and celebration. Guardians of the Galaxy. Tonight. BBC Proms - piling up in my iPlayer, and three actual chances to attend. I am most looking forward to John Eliot Gardiner conducting Beethoven’s Missa Solemnis.